Servings of lahmacun containing onion and egg face a potential ban on buses. Lahmacun is a wonderful Turkish dish, but, yes, a bit noxious when someone is eating it next to you in the closed compartment of a bus. Does that mean the Turkish state should ban its consumption on public buses? Turkish buses will no longer stink of lahmucun and salesmen will no longer knock on doors at all hours if Parliament approves the new Turkish Trade Code. Not as glamorous as reforms on freedom of speech, human rights or democracy, but updates to the articles of law are just as fundamental to the country’s bid to eventually become an EU member. Turkey has been invited to join at the European Union table, but before the country can be offered a seat, it will have to show it has the proper manners. A new draft of the Turkish Trade Code, which anticipates new measures affecting everything from packaging to eating habits, evoked an old debate on banning Kokoreç, a special Turkish dish made from roasted sheep’s intestines, on grounds that the cooking style is not hygienic. 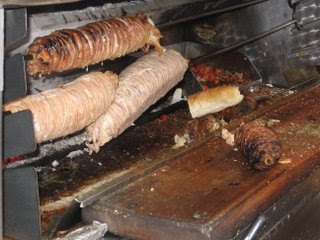 The new draft introduces restrictions to the consumption of strong smelling traditional Turkish dishes, such as lahmacun and pide, on public transportation. Amendments to the 51-year-old trade code were prepared with inspiration from consumer protection laws and regulations, which are given high priority in the EU. As a part of the harmonization process with the union, the draft law, with its 1,535 articles, aims to change many habitual behaviors in the Turkish trade scene. "We have some models which will put the obligations code, commercial code and application code into effect at the same time. I think they will come into force before 2010. The parliament’s decision is very important on the subject and the material is ready," head of the Parliamentary Justice Committee, Ahmet İyimaya, said. The draft will introduce some regulatory rules for public transportation. Transport companies will be responsible if the ticket is given to somebody else instead of the owner, if the vehicle determined in the ticket is replaced by something inferior or if the vehicle leaves before the scheduled departure time. Even if damage is not evident, the companies will have to compensate customers up to three-fold the ticket price. Also, measures will be taken to prevent noise, air and environmental pollution on public transportation. Within this framework, passengers will not be able to eat strong smelling foods like eggs, onions, pide and lahmacun, traditional Turkish dishes that includes meat and onion. Regulating the commercial affairs in Turkey, the draft law foresees strict control on vendors. Within the draft, door-to-door sales and sales by interrupting people walking in the street will be considered aggressive sales techniques and be punishable. Vendors will not be able to deceive customers by hiding the features, amount, intended use, benefits or danger of the products. It will be prohibited to sell half-empty bag of potato chips, big boxes for small volume perfumes and bottles with small interiors that appear large from the outside. Vendors, who act as if they have a special honor, diploma or prize in relation to their goods could be sentenced to up to two years in prison. Double taxation for foreigners will come to an end within the draft law. A foreign company, which invests in Turkey and pays the tax of its income in the country, will not have to pay a second tax when transferring the income to its own country. The financial reporting system will be conformed to European and U.S. standards, the draft law says. It will also launch "liability insurance" for some professional groups that may be obliged to pay indemnities while conducting their profession. In case a patient’s wrong kidney is taken, he will apply to the insurance company instead of the doctor to be compensated accordingly, says the draft law. Kokoreç is essentially grilled sheep intestine. For more on the culinary history of the dish, click here. A similar dish faced restrictions in Greece when it underwent integration. Interesting. Good point about the dish being important in its symbolic status. Did you ever try it? Is it any good?